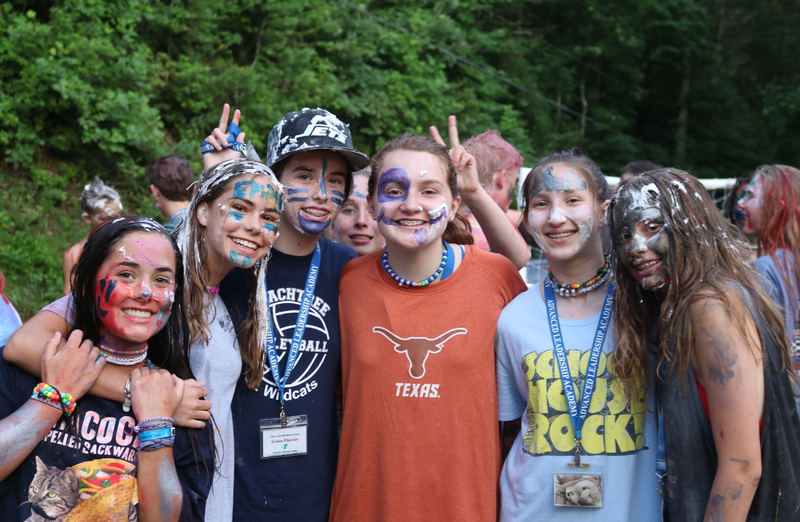 Freshman Annabel Winter and her friends from YMCA High Harbour, a camp in Georgia, pose for a picture during a de-stressing Friday at camp; the day’s activities included painting each others’ faces and throwing flour and shaving cream at each other. Winter is a CIT this year. Freshman Annabel Winter has been attending YMCA High Harbour for five years. It’s an overnight camp located in Clayton, GA on Lake Burton. She first heard about it from her brother who attended it, so she decided to try it out. She just finished her two years of Leadership Training this past summer so that she can be a CIT, or as it’s called at her camp, a LIT (Leader-in-Training), this summer. She went through trials with different cabins and tested what it would be like to work with different-aged children. As a LIT, she would not only help around the camp with set-up and clean-up, but she would also be helping taking care of the kids at the camp. She says the camp directors want to make sure they’re picking good, reliable people to take on these obligations, so they have the interested campers go through lots of preparation to even be considered. Winter had to get recommendations and go through an interview process during a retreat weekend, and she will be attending another retreat weekend in the spring to prove she is interested in the position. Junior Cate Mendivil has been attending all-girls camp Rocky River Ranch for ten years. “It’s just a really special place where I get to connect with my friends every year and connect with the outdoors,” Mendivil said. Photo by Rocky River Ranch. The camp has many different activities for campers to do. Since the camp in on Lake Burton, a lot of the activities are water-based, such as tubing, kayaking, and paddle boarding. Some of her favorite activities at her camp are horseback riding and paddle boarding. But Winter says the community is one of the main reasons that she loves the camp. For example, just sitting in her cabin, talking with her counselors and fellow campers was one of her favorite moments from the experience. “Every night in the cabin, [we] would hang out in [our] cabin and talk to the counselors and they could give [us] advice on school and stuff, so it’s just a good community,” Winter said. Not everyone is always themself at school or around people that they’re not familiar with, but with friends, family or a close-knit community, your true side can come out. For some people, camp includes all three of those things. People feel safe and comfortable to be themselves , whether that entails singing camp songs at the top of their lungs or trying new things that they never thought they’d like. She says she hopes to be a LIT so she can learn from working with the kids and acquire more skills from the experience. Having that type of responsibility and being depended on can really improve a person’s character and help them learn about themselves. It can also instill you with good skills and work ethic for the future when you’re getting a job. This is a reason that so many people want to be apart of CIT programs at their camps and these are some of the things Winter hopes to learn from the experience. 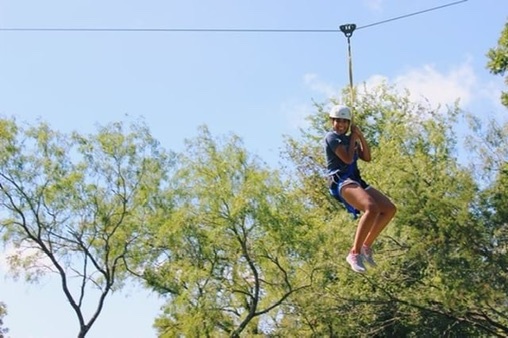 Catie Mendivil is a junior who’s been attending Rocky River Ranch, an all-girls overnight camp in Wimberley, Texas, for nine years and is about to go back for her tenth. Her mom was the one who decided to send her to camp, because she was only seven at the time and needed an activity to do over the summer. Mendivil’s mother went to the Palmer Events Center for a camp fair and found the booth for Rocky River Ranch. At the time, Mendivil was attending an all-girls school, so her mom liked the camp and its objective and felt that it would be a good fit for her daughter. Now she’s excited to take on the responsibilities of the people who took care of her for the last nine years as a camper. She’s really excited to be a counselor, because she loves going to that camp, and she really liked the relationship that she saw the counselors have with each other in her past years. She went through a three-year training process staring when she was 13, which included first aid and lifeguard training. The first year was seeing how she handled small responsibilities by having a little sister who she followed around a talked to. The second year she stayed in a cabin with all the other girls who were going through the program with her. They do several team building activities, like a high ropes courses. The third year is living in with the kids and making sure they are up to the role of a counselor. After all of that, she filled out an application about what she had done the past summers and after she accepted, she will go through threeweekends of training to learn the rest of the ins and outs of being a counselor. As a counselor, she also has to teach classes for the kids. When she was a camper, she enjoyed classes like archery, horseback riding, animal interaction classes, a random acts of kindness class and cooking, which she says she definitely wants to teach as a counselor. She says she loves all the people and the atmosphere of Rocky River Ranch, so she’s really excited to be a counselor and carry on there.